Pasta has gotten a bit of a reputation because it is considered a carbohydrate food, which many people believe leads to weight gain. Eating too much of any type of food can lead to weight gain, and the National Pasta Association notes that including the right kinds of pasta in your diet can benefit your health in many ways. Moderation is the key, and once you know more about the nutrients pasta contains, you can add it into your diet without worrying about your weight. Yes, pasta is a healthy food. To up the nutritional quality of your pasta meal, use pastas made from whole grains. Many people view carbohydrates as weight-gain enemies, but choosing the right type of carbohydrates may help you lose weight by filling you up and preventing hunger. 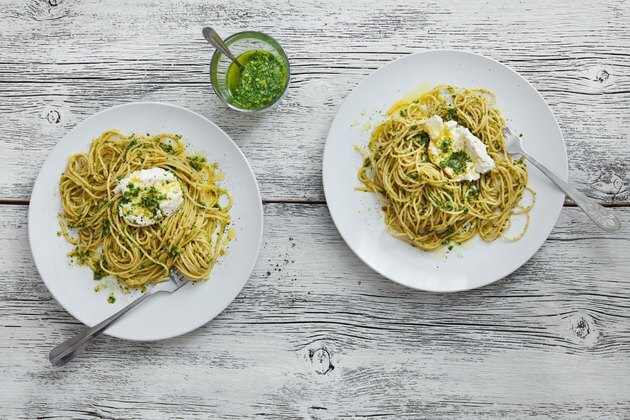 The National Pasta Association reports that pasta is a good source of complex carbohydrates, which release energy slowly so you may eat less in the long run. The carbohydrates in pasta also supply your body with glucose. Glucose is necessary for providing fuel to your brain and your muscles. Whole-grain pastas will provide more of these benefits than pastas made with white flour. Diets low in key nutrients can lead to health problems, sleeping difficulties, weight gain and fatigue. Many types of pastas are enriched with important vitamins and minerals, so adding them to your diet may help you increase your intake. Folic acid is one of the most common additions to pasta and is important for preventing birth defects and promoting a healthy nervous system. Iron is also commonly added to pasta, and getting plenty of iron will ensure that you have proper oxygen circulation and may help prevent you from feeling too tired. All types of pasta supply some fiber, but whole-wheat varieties are packed with this important nutrient. You need fiber for proper digestion and to promote the health of your heart and blood vessels. The National Pasta Association reports that 1 cup of whole-wheat pasta can supply up to 25 percent of the fiber you need each day. White pasta supplies much less, so choosing whole-wheat pasta is one way to maximize the nutrition that pasta offers. You should restrict cholesterol and sodium in your diet because they can lead to heart disease and other medical problems. Pasta is naturally cholesterol-free and is also very low in sodium. Replacing high-cholesterol and high-sodium foods with whole-wheat pasta is one way to cut these dangers from your diet. If you don't add salt to the water when cooking pasta, it can be a healthy addition to your menu.